The Colima people lived in northwest Mexico, in a rugged, low-lying coastal region carved by valleys, each with its own ecology and a warm, humid climate. Little is known about their modes of subsistence, as most of the information we have comes from artifacts from private collections and from the excavation of cemeteries, not residential sites, which usually provide this kind of information. We do know that they practiced irrigation farming, which allowed them to live in large groups in relatively independent villages and urban centers. Colima ceramics display a wide variety of figures and shapes, but little variation in technique. 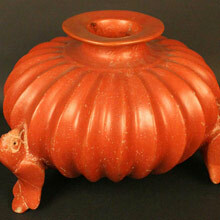 Most pieces have a burnished red finish and some are decorated with orange or white incisions. Molded figures are common, especially of plants, animals (especially dogs) and seashells. Human representations typically feature dwarfs and hunchbacks more than others, and few female forms. 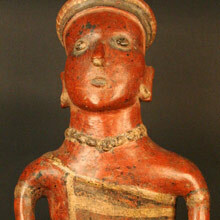 Many of these figures have “coffee-bean” eyes and are dressed in finely detailed traditional attire. Little is known of Colima stonework; only a few pieces such as mace heads, small masks and figurines have been found. These people also practiced basketweaving and weaving, and used metallurgy to make objects such as needles, axes, rattles, nose rings and ear ornaments. Little is known about the Colima’s social order, but shamans or priests may have occupied positions of social importance. 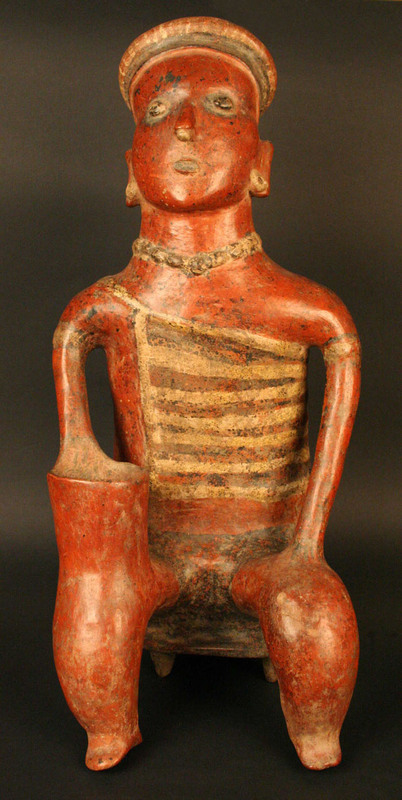 The existence of figurines resembling warriors as well as prisoners with hands tied points to the ceremonial importance of war in this pre-Columbian society. 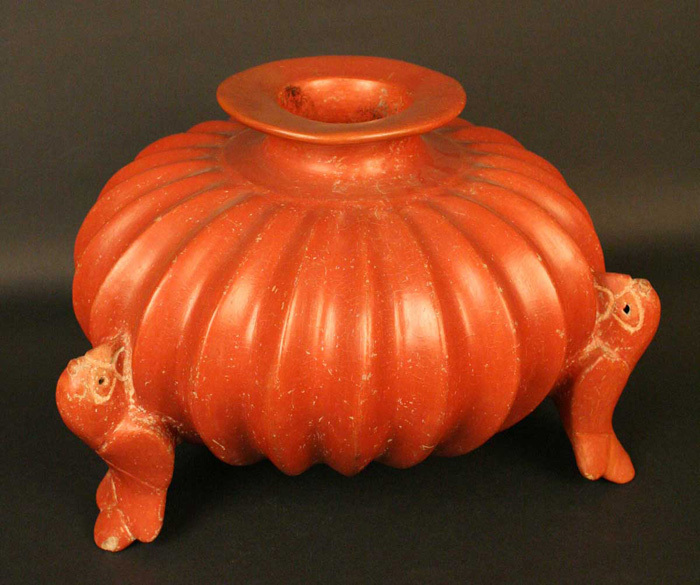 The vast majority of ceramic pieces that have been ascribed to this culture are grave goods found in the tombs of individuals of high social rank. The Colima buried their dead in family tombs up to 30 meters deep, some with multiple chambers. The bodies were accompanied by a wide variety of grave goods, including ceramic statuettes of armed men, which served as symbolic guardians. Ceramic sculptures of dogs were another common grave good, and were believed to be the emissaries of Xolotl, the god of death. The Colima people are believed to have lived in villages and small settlements, in which they grouped their dwellings around farm fields and water courses. Some larger villages had ceremonial centers that also served as trading hubs and markets. Their dwellings were made of perishable materials such as palm leaves, wood, and mud, but their temples were made with foundations of earth and stone. The history of the Colima people is not well known, but, like many Mesoamerican cultures, the Colima displayed some stylistic elements that links them with the ancient Olmecs. Formativo Temprano 200 a.C-300/500 d.C. Estilo Colima. Complejo Ortices. Formativo Tardío-Clásico Temprano 200 a.C. - 500 d.C. Estilo Pihuamo.